Learn the Technique to make a large Quilt As You Go. 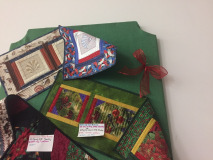 You will learn how to make a double sided quilt by taking this runner class. Each side can be completely different. This technique can be used for quilts, table runners, wall hangings with any size blocks. Using machine or hand embroidered blocks, Westalee, or pieced blocks. Two day classes &$35.00 includes pattern.